Facebook Login Approval Setup Screen. Facebook accounts have become prime targets for hackers and scammers. Are you tired of worrying about your Facebook account getting hacked? Are you trying to re-secure your account after an account compromise? If you answered yes to either of these questions then you might want to give Facebook's Login Approvals (Two-factor authentication) a try. What is Facebook's Two-Factor Authentication? Facebook's two-factor authentication (a.k.a Login Approvals) is an added security feature used to help prevent hackers from logging into your account with a stolen password. It helps you prove to Facebook that you are who you say you are. This is done by Facebook determining that you are connecting from a previously unknown device or browser and issuing you an authentication challenge, requiring you to enter a numeric code that generated by using the Code Generator tool from within your smartphone's Facebook app. 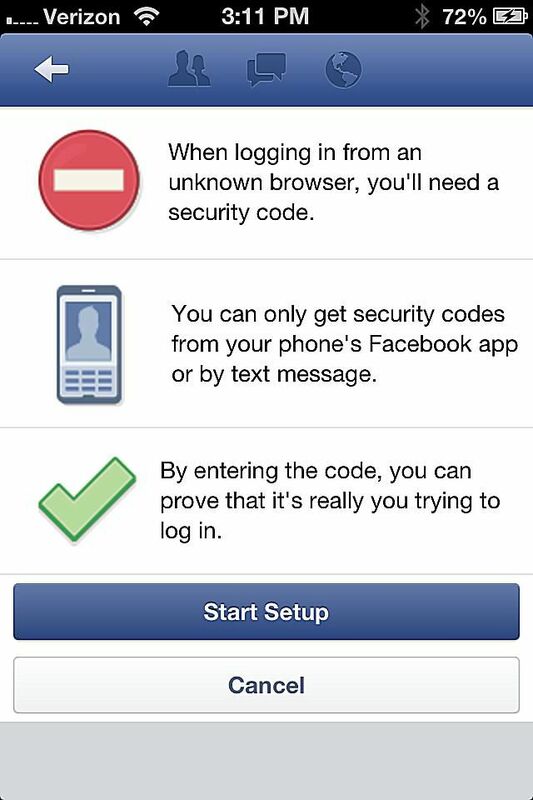 Once you have entered the code you received on your phone, Facebook will allow the login to take place. Hackers (whom hopefully don't have your smartphone) will not be able to authenticate since they won't have access to the code (unless they have your phone). 1. Log on to Facebook. Click on the Padlock near the top right corner of the browser window and click “More Settings”. 2. Click on “Security Settings” on the left side of the screen. 3. Under the security settings menu, click the “Edit” link next to “Login Approvals”. 4. Click the checkbox next to “Require a security code to access my account from unknown browsers”. A pop-up menu will appear. 5. Click the “Get Started” button at the bottom of the pop-up window. 6. Enter a name for the browser you are using when prompted (i.e. “Home Firefox”). Click “Continue”. 7. Select the type of phone you have and click “Continue”. 8. Open the Facebook app on your iPhone or Android phone. 9. Tap the menu icon in the top left corner. 10. Scroll down and select the “Code Generator” link and choose "activate". Once the code generator is active you will see a new code on the screen every 30 seconds. This code will act as a security token and will be requested whenever you try to log in from a browser that you haven't used before (after you enable login approvals). 11. On your desktop computer, click "Continue" after completing the code generator activation process. 12. Enter your Facebook password when prompted and click the "Submit" button. 13. Choose your Country Code, enter your cell phone number, and click "Submit". You should receive a text with a code number that you will need to enter when prompted on Facebook. 14. After you receive confirmation that the Login Approval Setup is complete, close the pop-up window. After Login approvals have been enabled, the next time you attempt to access Facebook from an unknown browser, you will be asked for a code from the Facebook Code Generator that you setup earlier. 2. Tap the menu icon in the top-left corner of the screen. 3. Scroll down and choose “Account Settings”. 4. Tap the “Security” menu. 5. Tap on “Login Approvals” and follow the instructions (should be similar to the process mentioned above).